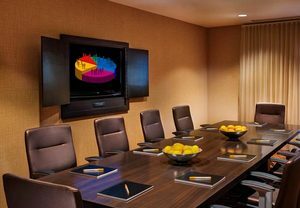 IRVING, TX--(Marketwired - Mar 17, 2014) - Planning and hosting a successful meeting is often met with words of praise, but at the Courtyard Dallas DFW Airport South/Irving, that hard work is rewarded with something tangible, too. Planners who book and host a meeting at this Irving, Texas hotel between May and August 2014 will earn double Marriott Rewards® points. Planners can choose from hotel meeting rooms near Dallas/Fort Worth Metroplex Airport including the Trinity ballrooms A and B, which combined can host up to 100 guests. On their own, they each offer a unique setting; in Trinity A, set up a classroom-style training for up to 44 people, or host a more intimate meeting with up to 12 guests in Trinity B. There are also two conference suites with boardroom setups available, offering the perfect setting for an important presentation or stakeholders meeting. The Dallas hotel offers more than just event spaces. Meetings can be enhanced with audiovisual features and custom catering including breakfast buffet options, themed lunches and breaks that offer afternoon treats including freshly baked cookies, brownies and other sweets. Guests can arrive with ease thanks to a 24-hour airport shuttle, and a 24-hour business center means there's no need to worry if important print-outs got left behind. The hotel offers meeting attendees other opportunities and spaces to connect outside of planned events, too. In the state-of-the-art lobby, flexible lounge-like seating, free Wi-Fi and The Bistro invite visitors to mix and meet in shared space. With double Marriott Rewards points, planners can continue to build their balance for a once-in-a-lifetime trip, or redeem for cruises, dining, spa and golf certificates, free nights and much more. To learn more about the program and its benefits, visit www.marriottrewards.com. Contemporary, comfortable and convenient, the Courtyard Dallas DFW Airport South/Irving offers the ideal stay for both business and pleasure. Guest rooms accommodate the needs of every type of travel, with a moveable desk and complimentary Wi-Fi for those on the clock, and HD plasma TV and plush linens for those wanting to get offline. For a little active relaxation, head to the fitness center and outdoor pool, or head out and explore Dallas Cowboys Stadium, Rangers Ballpark and Texas Motor Speedway nearby. Getting work done doesn't have to mean staying in the office or in one's guest room. The flexible lobby, featuring lounge-like seating and free Wi-Fi, offers a space for guests to work, meet, relax and eat. Enjoy a healthy breakfast or hearty dinner at The Bistro, and catch up on the local news and weather with the interactive GoBoard. Guests who need a more formal meeting room can pick from four event spaces; a 24-hour DFW Airport shuttle makes it easy for visitors to arrive at the hotel. Marriott rewards members can earn double points this summer when booking a meeting at Courtyard Dallas DFW Airport South/Irving.